WCM investments will continue to be a priority for a majority of firms surveyed, because of customer experience, operational, and eBusiness goals. 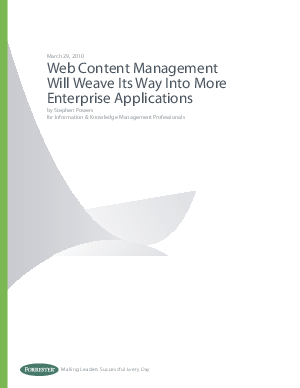 The survey shows that enterprises no longer see WCM systems as silos; rather, they increasingly want to integrate WCM with other enterprise applications, such as analytics, social networking, and rich media management. In addition, marketing and eBusiness organizations have gained a stake in WCM responsibilities, sharing them with IT. Overall, maturity appears to be increasing, leading organizations to consider their next-generation WCM strategies.